UnitedHealth Group (NYSE:UNH) beat market estimates on both revenue and earnings for the first quarter of 2019, allowing the stock to gain by 2.8% in premarket hours on Tuesday. Total revenues grew 9.3% year-over-year to $60.3 billion, driven by UnitedHealthcare Medicare & Retirement, OptumRx and OptumHealth. Net earnings attributable to UnitedHealth Group common shareholders rose to $3.4 billion, or $3.56 per share, from $2.8 billion, or $2.87 per share, in the year-ago period. Adjusted EPS grew 22.7% to $3.73. Premiums totaled $47.5 billion in the quarter, up from $44 billion in the same period last year. The consolidated medical care ratio was 82%, reflecting an increase of 60 basis points year-over-year, mainly driven by the revenue effect from the deferral of the health insurance tax. Days claims payable was 49 days. 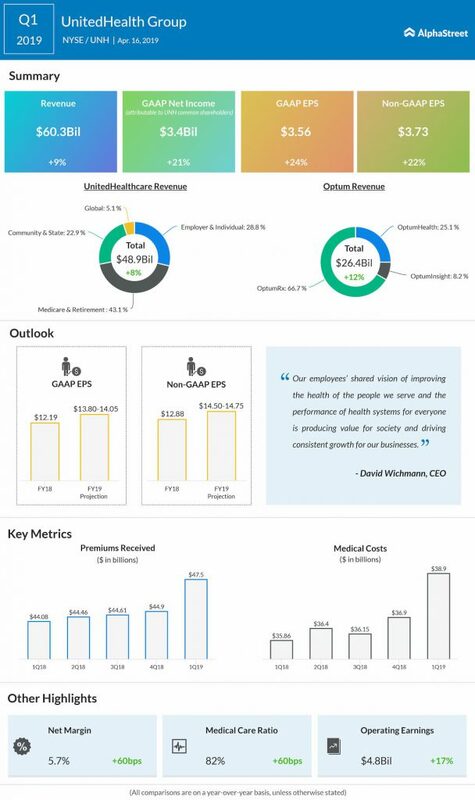 In the UnitedHealthcare segment, revenues grew 7.6% year-over-year to $48.9 billion, helped by revenue increases in all its divisions. Optum revenues increased 11.7% year-over-year to $26.4 billion, driven by growth across all units. OptumHealth revenues grew 16.6% year-over-year, driven by momentum in care delivery, behavioural health, and health financial services. OptumRx revenues grew 10.6% year-over-year, reflecting increased script volumes and a higher mix of specialty drugs. 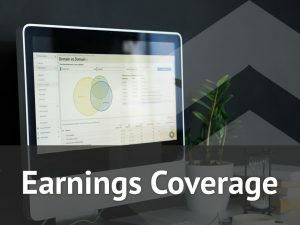 The company raised its earnings outlook for full-year 2019 and now expects GAAP EPS of $13.80 to $14.05 and adjusted EPS of $14.50 to $14.75.